The full retail price in US dollars. Gate opening refers to the distance between a carabiner’s nose and the fully open gate. Adding bias towards a larger gate opening is a great option once you’ve narrowed your choice to a few similar carabiners and need help determining which one is the best. Almost every carabiner you use will be non-locking offset D’s, with the exception of a Pear/HMS locker as your belay ‘biner. A modification of the standard D shape, the top of an offset D is much wider, allowing for a larger (and superior) gate opening. When loaded, most of the weight is transferred to the spine of the carabiner making them stronger than most other shapes. Used for top and bottom quickdraws, as racking carabiners, and lightweight lockers. The Pear/HMS carabiner is used primarily for belaying and/or setting a powerpoint in an anchor. The wide top means they can hold a lot of gear. They are almost always locking and are generally heavier (than D/offset D's) because they need more material to gain back strength lost due to their shape. The first carabiner shape to be mass produced. When loaded, the pressure is shared equally on both sides of the ‘biner. Since the weaker gate shares the load with the spine, oval biners aren’t as strong as shapes that direct the load to the spine. The bonus is, your gear rests squarely in the middle, so it's great for holding nuts, pulleys, and prusiks. D’s have a symmetrical shape that sets the rope closer to the spine, putting the load on the spine (versus sharing the load with the weaker gate side, like the oval). Since the strongest part of the carabiner carries the weight, D’s are the strongest shape. Downside: Smaller gate openings than the offset D.
Although most climbers wouldn’t refer to this shape as a “carabiner” they are certified by the same EN standard as all the other carabiners. These semi-permanent links ensure the gate will not accidentally open. They're used when setting up a semi-permanent rappel station (not used while climbing up). Semi-circle: Mostly used by Search and Rescue as this is a great way to secure a chest harness. 3-D: Designed to increase the gate opening and to reduce the chance that the rock will rub your rope and/or the locking gate open. Buy if you’re the curious type; they’re not cheap, and there’s not many in the US. Screw gates are generally lighter and cheaper. Auto-locking gates are usually considered safer as they automatically snap shut, not counting on one's memory to close and are harder to accidentally unlock. The debate comes on opening speed as some are much faster while others can be a struggle. Generally on beefier carabiners, so they're usually heavier and more durable. They can also feel more substantial in your hands while clipping. Often favored by sport climbers. Featured on the lightest carabiners, so they're favored by trad and alpine climbers. 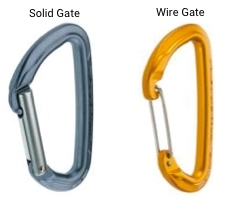 If you want keylock nose carabiners, then solid gates will be much cheaper compared to wire gates. When wiregates first came out they were not trusted (too new, looked too simple). Now, it's proven that wiregates have less gate flutter and gate shutter than solid gates. The standard. Always used as the bolt-end of the quickdraw, and still sometimes used on the rope-side too. Also used for racking gear such as cam and nuts. Created to make it easier to put the rope into a quickdraw with their larger gate opening. Primarily used on the rope-end (bottom) of quickdraws. 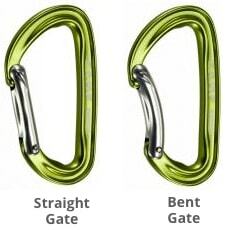 Choosing a bent or straight gate does not significantly change the weight, strength, or price of the carabiner. All locking carabiners have straight gates. Today, many wiregates have a hybrid almost-straight-but-kinda-bent gate and are offered in this version only (not as a classic a bent or straight option). We have classified these as bent gates since they're not totally straight. Many manufacturers are now making the bolt-end carabiner come standard in silver (to match the bolt color), and are coloring the rope-end with other anodizations. Do not mix (interchange) bolt-end carabiners and rope-end carabiners. This can be very dangerous as small abrasions made by the bolt can easily wear your rope. DMM put out a great video/write-up on this issue. A keylock nose means the nose is smooth. 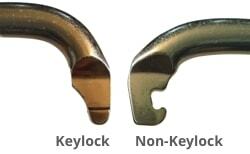 Keylock carabiners are also known as: snag-free, notch-less, and hook-less. The lack of a hooked nose makes for less snagging on gear and bolts – a dramatic improvement. Given that they’re more complicated to manufacture, keylock designs often come at a higher price, especially in wiregates. There are more design features necessary to guarantee a snag-free experience, like the curvature of the nose. Some keylock carabiners will still catch on the nose because of the lack of a smooth nose arc (smoother the arc, smoother the clip). Because sometimes matching is nice. Note: If you choose a color and the picture does not seem to match, this means it's also available in another color and we just don't have capabilities to show you that color on this page. If you click into the product you'll be able to see more product photos (hopefully!) of the color you're looking for. If a brand is missing from this list, scroll to the bottom of this page to see all the unfilterable gear we track, and ideally it'll be there.